Determine the commercial weight of natural or man-made fibers with Emerson’s highly accurate and reliable Conditioning Oven. Emerson’s Model 50021 Conditioning Oven is highly accurate and consistent, allowing for statistically accurate weighing of samples of natural and man-made fibers and materials. 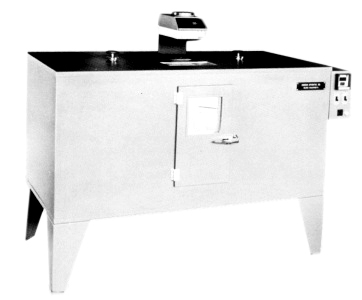 The commercial weight of a product is obtained by taking the difference between the gross weight of a sample and its weight after being scoured and “conditioned” (dried) in the oven. Emerson’s Conditioning Oven has two feed through rotatable carousels, each carrying multiple sample baskets. A balance positioned between the carousels with an access port permits weighing the contents of each individual basket without removing samples from the oven. Element control Solid state switching relay extends the life of the electrical components and eliminates RF noise by switching the current load at the zero voltage point of the AC cycle.